There is a long history of electric public transport in Cologne, the first electric trams ran in 1901 and they still serve much of the city, running mainly underground in the city centre. Buses mainly operate in a suburban and feeder role although a few routes to the south and west reach the city centre, one of which was operated by trolleybuses in the 1950s. Now the city has a further electric service with the full changeover of service 133 to opportunity charged VDL Citea electric buses in December 2016. The full introduction marked a key stage in the long term project which has presented the city with a number of challenges. Back in December 2015, Bus and Coach Buyer reported on a conference presentation where Rhein Energie, the electricity network operator in Cologne, revealed the difficulties in locating the opportunity charging stations. Although both it and KVB, the service operator, are ultimately majority owned by the city, there were issues with other city owned organisations in the placing of charging stations and excavations for their installation often revealed surprises including wartime ordnance. One 240kW charging point has been provided at the city terminus with two at the outer terminus. There are also individual 50kW charging stations around the perimeter of the depot for overnight charging and battery balancing. The constricted environment of Chlodwigplatz provides interchange with surface and underground tramways and is a significant passenger source for the 133. 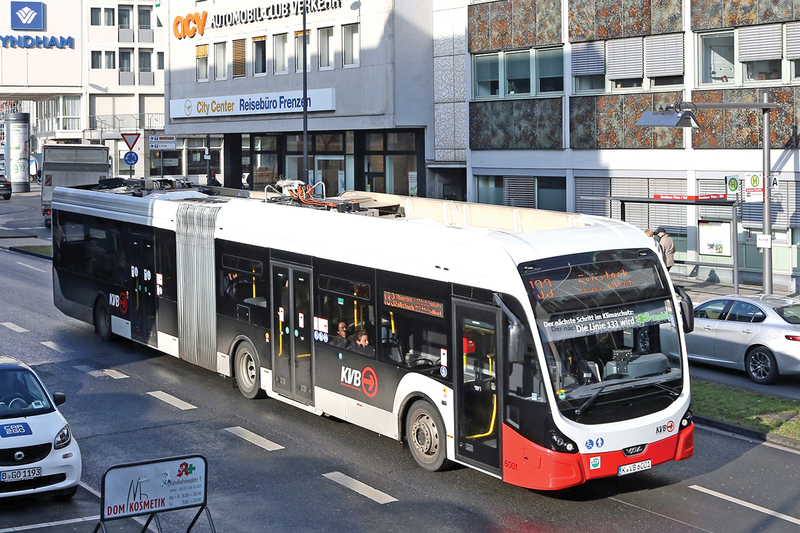 KVB ordered eight articulated electric buses from VDL for the project and worked closely with the manufacture on the design of the vehicles. KVB was concerned at the impact of weight distribution compared with a diesel vehicle so extra focus was placed on finite element analysis of the structure and the quality of welding in critical areas. 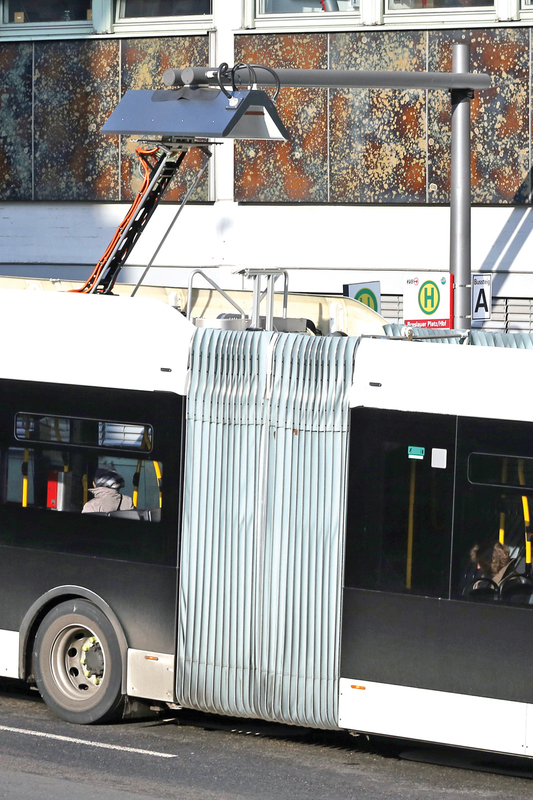 (There have been several high profile cases in Germany where, mainly, new tramway rolling stock has been found to suffer from sub standard welding). 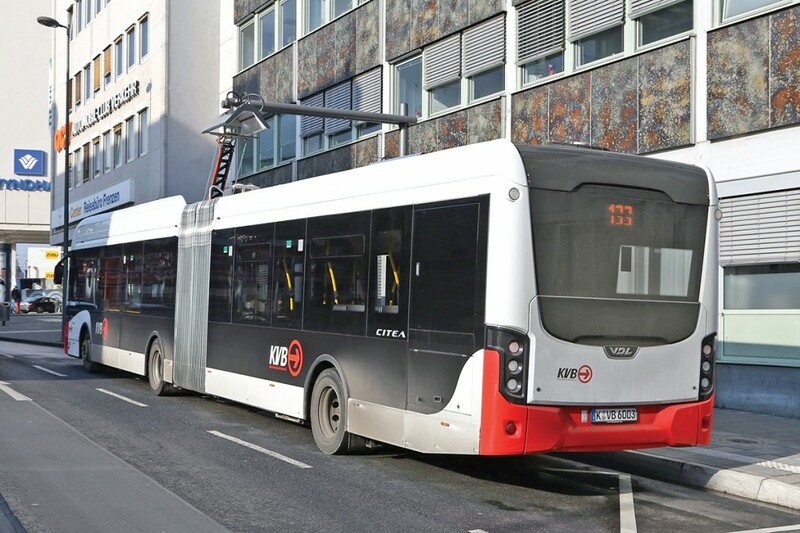 The 43 seat and 82 standing vehicles have a 122kWh nickel-manganese-cobolt battery pack mounted at the rear offside and is expected to achieve a minimum range of 30km at –20degrees meaning, in the worst case, one journey and return to depot under its own power. A prototype vehicle was shown at Busworld Kortrijk in October 2015 and extensive testing commenced early in 2016 covering not just traffic and engineering staff but also the control room team who will need to recognise early the development of situations where the vehicles’ access to recharging may be limited by traffic congestion. The vehicle interiors are plainly finished in shades of grey whilst externally there are large areas of black on a white base with just a small area of KVB’s traditional red and the company’s logos. Noticeable is the lack of significant branding internally or externally promoting the vehicles’ green credentials, just the words ‘the next step in climate protection’ with a green ‘emobil’ plug logo along the top of the windscreen. The 133 links Cologne’s main railway station with the southern cemetery in the suburb of Zollstock. It has a peak ten minute frequency, dropping back to 20 minute intervals during the day and 30 minutes in the evening. At weekends, a 15 minute service operates for most of the day. Riding the route revealed it serves a number of distinct purposes with different passenger and traffic characteristics. Charging on street at the terminus behind the main railway station. The railway station terminus is located on street between the station and the river Rhine with a kerbside charging point located on a slight upward slope. The diesel bus operated 132, which parallels the 133 on the first stage of its route, terminates closer to the railway station in the now relatively little used bus station. Boarding takes place whilst the vehicle charges, helping to ensure a punctual departure. 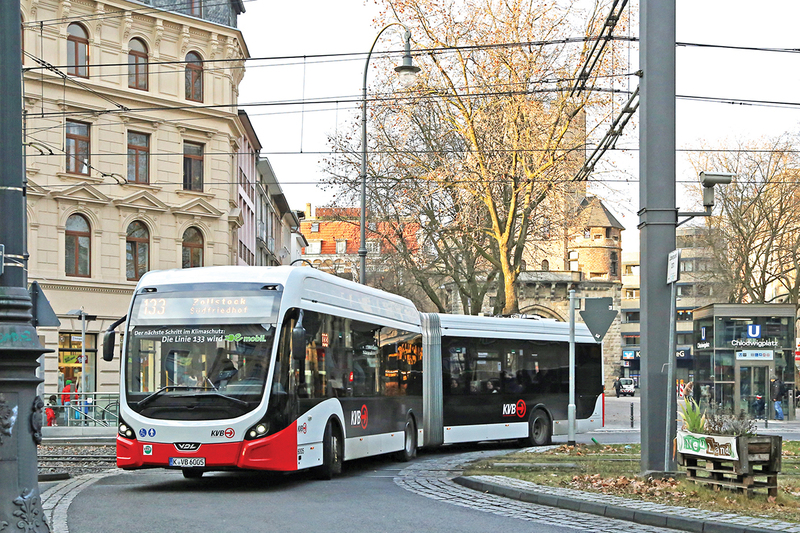 On departure, a U turn is made at a tight roundabout at the top of the street to return to the Rhine embankment and almost immediately the bus enters the tunnel that keeps traffic out of the old city centre. At the end of the tunnel, a diversion is made from the embankment to serve the first stop, the important tramway interchange at Heumarkt. This has a single loading point inside a tight single lane turning circle used by the 132 and 133 in both directions. Significant numbers of passengers board here for the next section of route through the redeveloped riverside area, a busy stretch of road where the lack of vibration and noise whilst standing is noticeable. Prior to the tramway being put underground, this section was served by tram and the 133 turns away from the river where the modern tramway joins it as part of the interurban route to Bonn. The next two stops provide further interchange with the tramway and on leaving the second one in the congested shopping area at Chlodwigplatz, the bus is well filled with new passengers, very few from the riverside section having remained on board past the two interchanges. Heading outbound past the charging point after a tight U turn at the top of the street. After a short section paralleling the partially open north-south tram subway, the 133 takes on a much more suburban aspect, setting down passengers at most of the stops which serve varied housing areas before the terminus at Zollstock is reached. Set down and pick up points, the latter with charging masts, are situated on opposite sides of the green space formed by the terminal loop of the tramway which has reached Zollstock from the opposite direction. The 133 has a total route length of around 7km and an end to end running time of 30 minutes. All eight vehicles are required at peak times with a diesel vehicle having to step in if one is unavailable. The City of Cologne expects the changeover of the 133 to electric operation will save some 520 tonnes of CO2 emissions annually in addition to reducing NOx and particle emissions, necessary as the city reports it currently exceeds their limits by some 50%. The vehicles stand out amongst KVB’s fleet and thus distinguish the 133 as being different to other services, there appearing to be no mention on bus stops or printed material that it was operated with electric vehicles.